Do you like the bold flavors of garlic and ginger and want to reap the benefits of a natural probiotic food source? If so, this golden sauerkraut recipe is just for you. Making sauerkraut at home may seem a little daunting but to be honest waiting the 4 weeks for it to finish fermenting will be your biggest feat. The best part about his recipe is that I experienced 0 issues within the vessel- no scum or mold the entire time! Give it a try, you won't be disappointed. A safe, easy, healthy and economical way to preserve food. "Lacto" refers to the bacteria, Lactobacillus, which is responsible for the lacto-fermentation. This strain of bacteria is found in nature (on plants) and in our gastrointestinal tracts. During the fermentation process, the bacteria converts sugars into lactic acid which is a preservative and inhibits growth of harmful bacteria. Keeping the vegetables under the level of brine will ensure the harmful bacteria stay out so the good bacteria can flourish. We are creating an anaerobic, acidic environment which also helps prevent any risk of Botulism. Cabbage– choose the freshest you can find; preferably organic /unsprayed. Salt– opt for sea salt or pickling salt. Do not use iodized salt (inhibits good bacteria growth). Water– should be free from chlorine, chloramine and fluoride for the best finished product. Suitable Containers: A 1-gallon container is needed for each 5 pounds of fresh vegetables. Therefore, a 5-gallon stone crock is of ideal size for fermenting about 25 pounds of fresh cabbage or cucumbers. Food-grade plastic and glass containers are excellent substitutes for stone crocks. Other 1- to 3-gallon non-food-grade plastic containers may be used if lined inside with a clean food-grade plastic bag. Caution: Be certain that foods contact only food-grade plastics. Do not use garbage bags or trash liners. 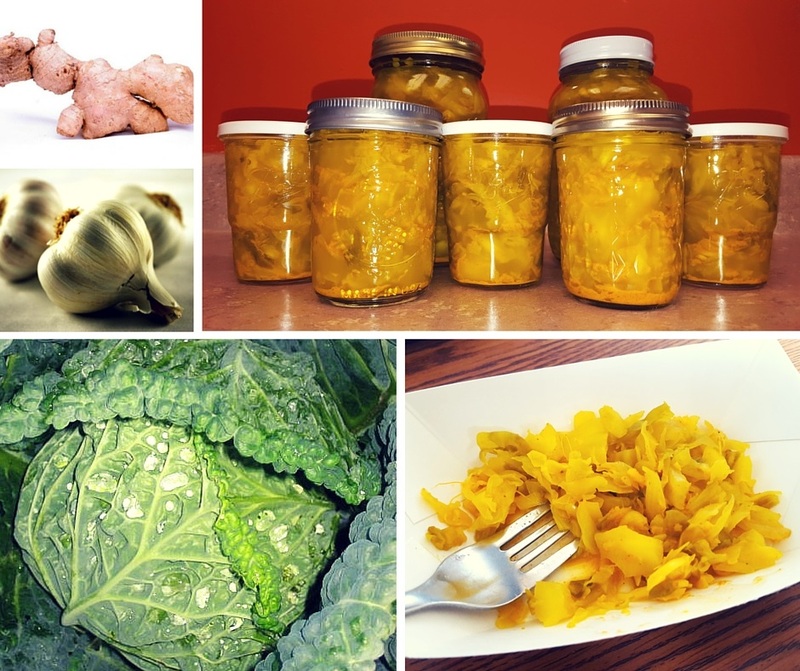 Fermenting sauerkraut in quart and half-gallon Mason jars is an acceptable practice, but may result in more spoilage losses.